Because iron is very heavy, it makes sense to make larger iron sculptures hollow. Here a core that will ultimately be the empty inside of an iron wooly mammoth sculpture has been carved out of resin sand. Resin sand is a mold making material that will withstand the heat of molten iron until the iron solidifies. This core is starting to be covered with about ½” of modeling clay. 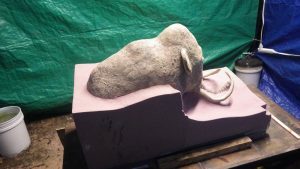 Thinner elements – the tusks and trunk – also have a wire to support the clay. The clay and wire will be removed later leaving a space to be filled with iron. Here the modeling clay layer is complete and mold pieces made of resin sand are being built to cover it. 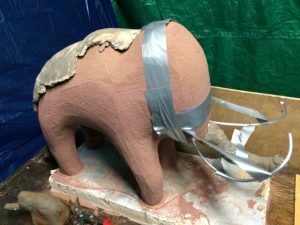 When the pieces are complete, the mold is taken apart, the clay is removed, and the mold is reassembled with heat resistant glue. Next, the space where the clay used to be will be poured full with molten iron and allowed to cool. Then the resin sand will be broken up and removed from the outside and inside of the iron sculpture.